This document is for HP Sprocket Photo Printers, and the HP sprocket app for Android mobile and Apple iOS devices. 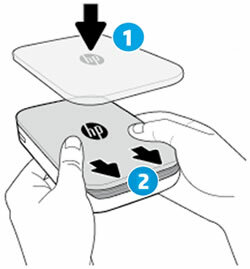 To set up a printer for the first time, remove the printer and all packing materials from the box, install the HP sprocket app, pair your printer and mobile device, load HP Sprocket Photo Paper, and then calibrate the printer. Remove the printer from the box, remove any plastic packing material from the printer, and then recycle the packing materials. 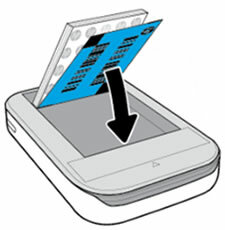 Install the HP sprocket app on your mobile device, and then pair your mobile device to the printer using a Bluetooth connection. The app is required to connect the printer and print photos from your mobile device. 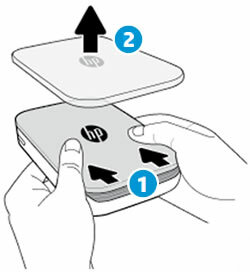 Go to the HP Sprocket (in English) homepage, and then follow the on-screen instructions to download and install the app. After the app installs, turn on the printer. On your mobile device, open the Bluetooth settings menu, and then make sure Bluetooth is enabled. Open the HP sprocket app. If a Welcome screen displays, tap the setup option, and then follow the on-screen instructions. If a prompt displays to Reveal with AR, tap Enable Reveal or No, Thanks. For more information, go to Using Reveal to Relive Memories. Tap the Menu, tap sprocket, and then tap Manage Printers. A list of available Sprockets displays. If your printer displays, the printer is connected. If your printer does not display, tap Add New Printer, and then tap your printer. Load 5.0 x 7.6 cm (2 x 3 in) HP Sprocket Photo Paper into the input tray. Remove the top cover by sliding it away from the output slot, and then set it aside. Align the top cover with the tracks on the outside of the printer, and then slide the top cover toward the output slot until it is firmly seated. Send a print job with the HP sprocket app to calibrate the printer with the Print Quality Card. On your mobile device, open the HP sprocket app. From the home screen, select the photo you want to print. The image preview screen displays. Tap Edit or the Edit to adjust the photo appearance, add text or stickers, and apply filters. Tap the Checkmark to save any changes, and then tap the Print. The printer calibrates using the colored card. Wait until the Sprocket is idle and silent, and then remove the colored card. After calibration completes, your photo prints.